St Patrick's Day Parade in Dublin. St Patrick’s Day (in Gaelic: Lá Fhéile Pádraig) is held on the 17th of March, a date widely believed to be the date of the death of the eponymous Patrick himself. An approved Christian feast since the early 1600s, the St Patrick’s Day celebrations that take place all over the world amongst the widely scattered Irish diaspora are a joyous reflection of all that is best about Irish heritage and culture. 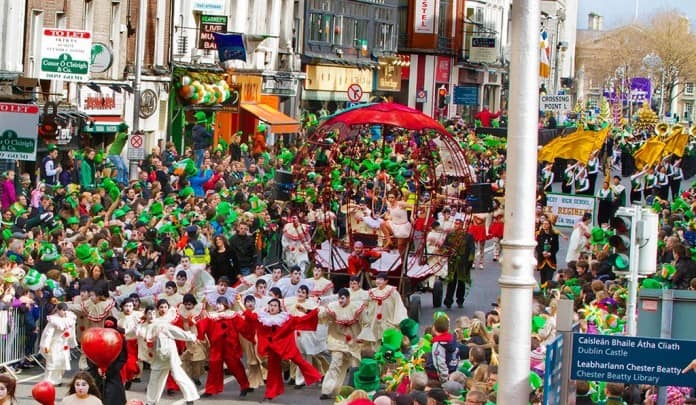 The festivities generally include a grand parade, céilithe and, of course it goes without saying, the wearing of green clothing and a shamrock or two. Christians also attend church services and, luckily, the restrictions associated with Lent are lifted on St Patrick’s Day, which is certainly beneficial when you consider the great importance of raising a pint or three of shamrock-topped Guinness as you parade in style. It is thought that Saint Patrick was born in the fourth century. A true son of Roman Britain, his family were wealthy and his life privileged. However, when he was just sixteen years of age, he was captured by raiders from Ireland and was taken there as a slave. Legend tells that he stayed in Ireland for six years, tending sheep. It was while working as a shepherd that he saw a vision from God, who told him to make haste to the coast, where he would find a ship that would take him back to Britain. Once he was home, Patrick made his vows and became a priest. Later he returned to Ireland, determined to spread the word of God and convert the pagans of Ireland into Christians. It is said that he converted many thousands of people to the Christian faith. Revellers celebrating the St Patrick’s Day Parade in Wappinger Falls, New York. On the day itself, if you have any Irish connection whatsoever, it is practically obligatory to wear either green clothing or shamrocks. This is known as ‘the wearing of the green’. It is said that St Patrick used a shamrock as a visual aid to help pagans grasp the concept of the Christina Trinity. In fact, for pagans in Ireland the number three was deeply significant, and the worship of triple deities was common, which may perhaps have made them more open to concept of Christianity. The colour green has long been associated with Ireland. As long ago as the 1640s, the Irish Catholic Confederation adopted a green flag with a harp motif. Shamrocks and green ribbons have been proudly worn and displayed since the 1680s on St Patrick’s feast day. The phrase ‘the wearing of the green’ derives from the song of that name, which bemoans the fact that supporters of the United Irishmen were persecuted for garbing themselves in green. In more recent times, wearing green has become increasingly synonymous with St Patrick’s Day. Up until fairly recently, it was also very common to see those taking part in the celebrations wearing a ‘St Patrick’s Cross’. These decorative Celtic crosses were constructed from paper and then covered in ribbon or silk and finished with a central green rosette. There is plenty of folklore associated with St Patrick, with one of the most common tales being that he drove all of the snakes out of the country. Sadly for those clinging to this particular myth, the climate of Ireland and the habitat of snakes are not compatible, so it seems that there never were any snakes for St Patrick to deal with. In fact, many commentators see this tale as allegorical – that is, the snakes in the tale represent evil, and their banishment is a metaphor for how St Patrick converted so many pagans to his Christian faith. 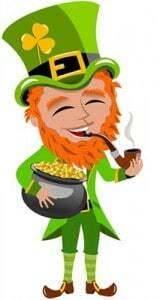 Another motif common to any celebration on this day is the Leprechaun. These mischievous fairies have been entrenched in Irish mythology for centuries and are generally represented as tiny, very solitary men dressed entirely in green who work as cobblers. It is said that they guard the gold that is found at the end of rainbows, and that if captured by a human, they will offer three wishes in exchange for their freedom. They have clawed their way into the St. Patrick’s Day festivities not because they have any association with the saint, but because they are so quintessentially Irish. St Patrick’s Day was declared an official Irish public holiday in 1903, and the first large-scale revelries were held that same year in Waterford. Dublin’s first such gathering was rather late to the party, taking place for the first time in 1931. 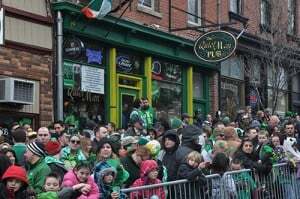 Since then, countless other locations right across Ireland and the rest of the world hold their own glorious gatherings on St Patrick’s Day. 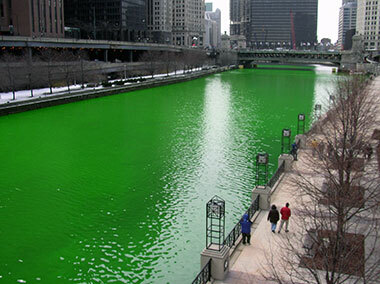 Chicago River dyed green for St Patrick’s Day. The 17th of March is not a public holiday in the US, but this certainly doesn’t stop Irish Americans throwing themselves into the spirit of the day with great gusto. The revelries include special church services, conspicuous displays of green and plenty of good-natured drinking and eating. Indeed, St Patrick’s Day has been observed in North America since the late 1900s. One of the most famed state-side events is held in New York City. The parade that takes place in the Big Apple has a long and proud history dating right back to 1762 – a full fourteen years before the Declaration of Independence was signed. Incorporating 150,000 marchers plus around two million spectators, it runs from East 44th street via Fifth Avenue and finishes at East 79th Street. Another notable celebration takes place in Chicago, where the river that runs through the ‘Windy City’ is dyed green every year in honour of the day. Similarly, in London, where St Patrick’s Day is marked every year with great enthusiasm, the waters of the famous fountain in Trafalgar Square have in the past also been dyed a vivid green. Food forms a huge part of the day, as is the custom to feast in honour and celebration of the Saint. 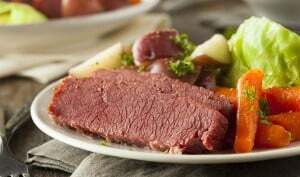 The fare most associated with St Patrick’s Day is corned beef and cabbage, a simple but delicious dish with a very interesting if somewhat controversial provenance. In times past, beef was a very scarce commodity in Ireland and was regarded as a luxury reserved for only the most special of occasions. Bacon was far more readily available, and many traditional Irish dishes involved bacon and cabbage. However, following the dark days of the Great Famine, the many Irishmen, women and children that emigrated to America found that corned beef was readily available and cheaper than bacon, replacing it both in their affections and as their staple dish. Over time, a new tradition began of enjoying a boiled meal of cabbage, corned beef and various root vegetables, which is the meal cooked by many people today on St Patrick’s Day before they go out to a parade. However, there are those who avow that bacon should be used. The controversy rages on, but whether you are on Team Bacon or Team Corned Beef, at least you can’t go far wrong with the cabbage – shamrock garnish optional! Today each shamrock-strewn parade that takes place on St Patrick’s Day is a true celebration of the indomitable Irish spirit, the influence of which is seen all over the world. What is St. Patrick Known For?